This month has seen the launch of our new website which will allow us to provide more up to date information as well as providing a home for these monthly updates. We have worked with Jazzbones who are based in Old Town to develop the website and are really happy with the result. They have also trained us how to add updates ourselves and if you are reading this, then we’ve successfully remembered what we have been taught! 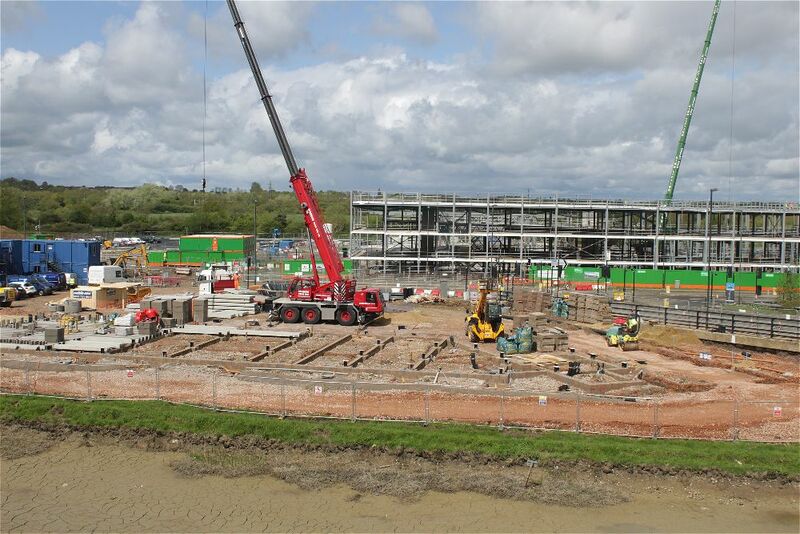 The past month has seen work continuing on the Deanery CE Academy which in addition to the steel frame now has sections of the floor and the staircases in place. The Hall and Woodhouse pub is also progressing well with the foundations almost complete. Running between these two sites, the road construction has been focussed on drainage and services, as well as works to complete the footpath surfacing over Foxham Way Bridge. The second phase of the canal works have also started on site and whilst we carried out a number of surveys in advance, we couldn’t be 100% sure what we would find once the water was removed. Feedback from the Wilts and Berks Canal Trust as well as the survey results meant we were expecting a lot of silt and it is currently estimated that we will remove around 2000 cubic metres of material. We also caught and relocated around 7000 fish using a specialist fish rescue company. The local herons were well fed during this period as they appeared in the evenings to help with the fish removal. A platform is currently being constructed in the base of the canal from which the bank works can be completed. After exploring the options available, working from within the canal provides the best form of access whilst protecting the existing banks and allowing the construction activity on the banks to continue in parallel. Alongside the construction, the design of a few other aspects of the Canalside area have been coming together. In the next couple of months planning applications will be submitted for the Middle Wichel Primary School, the Freeman Retirement Living housing scheme and improvements to the landscaped area alongside Peglars Way. We will add more details to the website as each of these applications comes forward as well as details for the public consultation on the school plans which will take place later this month. Attention has also started to turn to the next phases of development which will be delivered by the Joint Venture between Swindon Borough Council and Barratt Developments. The first housing will be delivered at the north of West Wichel and just to the east of Waitrose where the contractor building the new section of road currently has their compound. The design team have been meeting regularly in order to both draft up the Design Codes and start to design the first housing parcels which will be delivered under both the Barratt and David Wilson brands. It will take a few months to refine the design proposals with the Local Planning Authority, so look out for the public consultation on these plans later this Summer.